The remedy is clove, you can use whole clove, ground clove or ideally clove oil. I know, I can hear you saying nothing new here, it’s that same old clove toothache remedy, and you’d be right, HOWEVER, how many of you have actually tried it? Many of us are aware of popular old timer home remedies and we instantly dismiss them as hogwash. If I am honest I was the same way about clove toothache remedy, that was, until I tried it… There is nothing new here other than me urging you to give this natural remedy a try the next time your or a family member has toothache. I think you will be pleasantly surprised by the results. You will need: some salt, olive oil, cotton balls, cloves, ground cloves or clove oil. Clove oil is best, if cloves or ground cloves is what you have, use that. Before either method, firstly swill your mouth thoroughly with some warm salty water. It’s important so don’t miss out this step! Clove oil method – mix 3-4 drops of clove oil with around half a teaspoon of olive oil and then soak a cotton ball in the mixture. Now place and hold it in your mouth against the sore tooth or gum. Once the pain has eased, spit out the cotton ball and discard. Do not use this method in bed at night as it’s obviously a choking hazard. Whole cloves/ground cloves method – if you have whole cloves you need to ground them up, as it is ground cloves we need. Take a large pinch of the ground cloves and pack it against the sore tooth or gum. Again leave in place until pain has eased and then spit out. This clove toothache remedy will only ease the pain of the toothache. It does nothing to treat the cause of the toothache itself. Additionally, I have also added a home remedies for toothache infographic below. The infographic includes some additional toothache home remedies you can try. SLS is a chemical detergent and foaming agent. It is often found in liquid soap, shower gels and shampoo and it is a common skin irritant. It is thought that some people who experience regular mouth mouth ulcers and swollen gums, could be sensitive to SLS. If you want a easy to make, fluoride free toothpaste recipe that ‘apparently’ helps to remineralize your teeth and strengthen the tooth enamel, this toothpaste recipe from ‘Keeper Of The Home’ contains the wonder ingredient – coconut oil (see our previous post: 101 Coconut Oil Uses) plus sea salt and peppermint oil. Witch hazel (Hamamelis virginiana) is a flowering shrub/tree which is common in North America and Japan. The witch hazel plant extract is derived from the leaves and bark of the shrub, and offers many benefits and uses especially for those seeking safe and natural treatments. Witch hazel offers the benefit of being able to remove blemishes and bruises as well as inflammatory skin conditions. Apply to the skin straight from the bottle using a cotton ball or cosmetic pad. Witch hazel also helps remove discoloration from bruises and makes the healing process speedier. It can be applied up to three times daily. A popular use of witch hazel is as a natural astringent. This is because it contains a high concentration of tannins. This means the witch hazel can be used as an astringent to rid the skin of excess oil and clear the pores. There are a lot of contaminants in the air which enter the skin’s pores. The witch hazel, when applied, reduces those contaminants and makes their effects on the skin less severe. Regular use may also prevent blemishes from returning and lessen the likelihood of blackheads forming. Another of witch hazel’s benefits and uses is that it can be applied to stop bleeding for minor cuts and scrapes. The reason why witch hazel does stop bleeding is because it serves to tighten the skin and this in turn promotes faster healing. So apply it to those small cuts and scrapes to help the bleeding to stop. Witch hazel bought in a store often contains isopropyl alcohol which helps cleanse the wound, offering an added benefit. An itchy scalp can be very irritating and annoying. A natural way to ease the condition is to use witch hazel. Just mix one part witch hazel with two parts water and then pour a little of the solution on the scalp. Massage into the scalp then rinse. Use witch hazel to shrink swollen veins by soaking a soft terry cloth in the liquid and laying it over the area affected by varicose veins. This temporarily removes pain and swelling. The affected areas should be propped up as high as possible during treatment as this will reduce blood pressure in the swollen veins. Hemorrhoids to say the least are very uncomfortable as they itch, swell and bleed. One of the uses of witch hazel is to provide relief for the condition. Witch hazel is often an ingredient used in commercial hemorrhoid products, but a simpler and cheaper option is to mix it with Aloe Vera Gel and apply it to the affected area. This will provide fast relief. Witch hazel offers many advantages compared with commercial acne treatments. The commercial products tend to be harsh whereas witch hazel is gentle and non-drying and is ideal for toning and cleansing skin which is acne-prone or actually infected with acne. Witch hazel is perfect for treating the condition because it is a natural astringent thanks to its high tannin content. It also has antioxidant properties. Witch hazel should be applied to acne-affected areas twice a day straight from the bottle using a cotton pad. Witch hazel is perfect for men and women to use after shaving any part of the body. Firstly witch hazel is able to stop minor bleeds such as nicks and cuts, something which can happen when shaving with a wet razor. Secondly the plant extract also has anti-inflammatory properties which can prevent or reduce the effects of razor burn. Thirdly for those who remove hair through hot wax treatment witch hazel is also useful as it can be used as an anti-inflammatory following waxing and help stop bleeding from hair follicles that have been damaged by the process. Diaper rash can cause distress to a baby but this can be dealt with thanks to witch hazel’s soothing properties. It is especially useful if the diaper rash is healing slowly. Apply a witch hazel solution to the affected area and there will be an immediate improvement. Puffy and discolored areas around the eyes are not very attractive but one of the benefits of witch hazel is that it is able to deal with the condition in a natural way and avoid the need to use chemical laden products. This is because witch hazel is a natural astringent able to tighten the skin, treat the discoloring and reduce the puffiness around and under the eyes. While treating puffiness is one of the most important benefits of using witch hazel it is highly important that none of it gets in the eyes, so be careful. Another use of witch hazel is to soothe chicken pox blisters. It is very simple to prepare and involves taking a cup of witch hazel and another one of water. The two are then mixed and should be applied liberally to the affected areas on the body and then allowed to dry. This chicken pox blister treatment using witch hazel can be used as often as needed as it uses natural ingredients with no chemicals. A natural way to treat damaged gums is to use a witch hazel mouth rinse. It is important that witch hazel containing isopropyl alcohol is not used for the treatment. To gain maximum benefit, use only the natural product. Witch hazel reduces pain and swelling caused by irritated or infected gums and also helps stop minor bleeding in the mouth. A teaspoonful of witch hazel with a drop of clove and myrrh oil can also reduce pain caused by emerging wisdom teeth and also ease the pain suffered by infants who are teething. Among the many witch hazel benefits is the ability to treat “swimmer’s ear.” Swimmer’s ear – otitis externa to give the condition its medical name – affects the ear canal and is caused by a microbial infection. The ear becomes clogged up with pus, wax and other debris. This can be treated by putting a few drops of witch hazel into the affected ear using an eye dropper. The witch hazel allows the ear to drain and then it can be cleaned with a cotton swab. Certain plant compounds can irritate the skin and cause severe itching. Witch hazel is excellent for curing the areas of the skin affected by the likes of sap oil from poison ivy and poison oak which can cause contact dermatitis. It helps dry the affected skin and prevent it itching. One of the uses of witch hazel is to help cure a sore throat. This is why it can be very handy to have a witch hazel bush growing close by. Soak the leaves with some of the twigs in a cup filled with very hot water. A few cloves can be added for flavor. They should be soaked for at least 15 minutes. The solids should then be strained off leaving a cup of witch hazel tea. The tea is then gargled and the witch hazel’s properties will soothe the throat and reduce swelling. Witch hazel can be used as a natural way to cleanse wounds and scrapes, big and small. It is able to cleanse the skin of germs and bacteria and also soothe any inflammation. The skin cleansing properties of witch hazel are well known to tattoo artists, many of whom use it clean new tattoos. During the summer people become hot and sweaty and the skin becomes oily. One of the benefits offered by witch hazel is that it can refresh the skin. Just soak a cotton pad with witch hazel to wipe away the oil and other impurities and the skin is refreshed. Witch oil is great to use after a shower because it seals in moisture and prevents dry skin. This makes witch oil a superior astringent to commercial products as they tend to be drying which is detrimental to people who suffer dry skin conditions. If someone has a cold sore they will not want it becoming a blister. Witch hazel provides a safe and natural way to prevent this happening. As soon as the cold sore begins to appear witch hazel should be applied. If a blister has already appeared it will heal even quicker if the plant extract is used. Witch hazel provides a solution for people who suffer psoriasis, eczema, or dandruff. Massage into the scalp before using a shampoo and conditioner. Witch hazel is also an ideal way to wash hair between washes with shampoo and conditioner. Witch hazel benefits include the ability to ease bug bites and stings. Witch Hazel’s anti-itch and anti-inflammatory properties help provide relief for those unfortunate to have suffered a stings or bites from bees, wasps, fleas, flies and other insects during those hotter months Apply it, using a cotton pad, to the bite or sting to bring relief. The skin will peel following severe sunburn, but witch hazel will prevent this and help the affected area to heal. This is all down to the plant extract’s exceptional anti-inflammatory properties. Not only will the skin be prevented from peeling, which is both unpleasant and unsightly, witch hazel along with Aloe will help cool the burn and ease discomfort. As most men will know aftershave can be very expensive. However, there is a cheaper and natural alternative. It is witch hazel. This natural product has all the essential ingredients for an aftershave. It helps tighten the skin and serves as a moisturizer. Witch hazel also has anti-inflammatory properties which means it can deal with shaving hazards such as razor burns as well as stem bleeding from little razor nicks. Some users prefer the scent of standard aftershaves and they continue to use them following a shave after first splashing on the witch hazel. Many people suffer tired eyes, especially at the end of a long day, and it can be extremely uncomfortable. One way to deal with this is by using witch hazel. This is very easy to do and the whole process can take less than 15 minutes. Just mix some witch hazel in a bowl of cold water. Take a clean cloth or flannel and soak in the water. Then place the cloth over the closed eyes for around 10 minutes. This should leave your eyes refreshed and remove any redness. The witch hazel cold compress can also help someone who has been crying to look and feel much better. 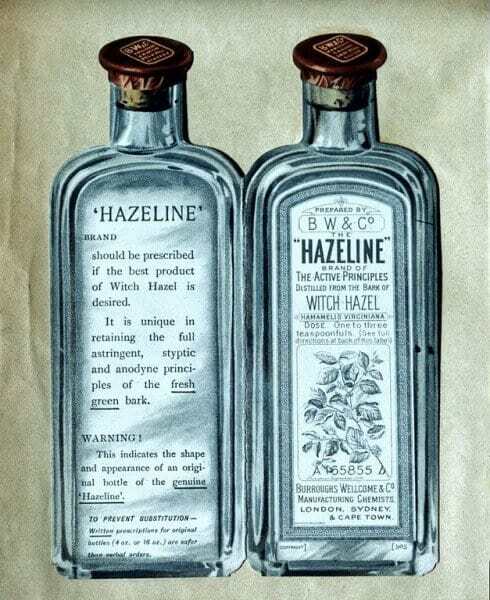 Many commercially produced deodorants contain witch hazel. However, people do not have to spend their cash on purchasing these products; if they have some witch hazel they can make their own homemade deodorant. All that is needed is 4 tablespoonfuls of the witch hazel. What other ingredients are used will depend on personal taste. One suggestion is a tablespoonful of vodka along with 2 tablespoonfuls of cornflower water and orange flower water. Also add 10 drops of both cypress and geranium, 8 drops of bergamot, 5 of neroli, 4 of lavender and 3 drops of black pepper. The essential oils should be added one by one into a bottle and then shaken vigorously until dissolved. Then pour in the witch hazel and flower waters and shake well. The result will be a bottle of home produced witch hazel deodorant. If you like using traditional treatments and home remedies, make sure you check out our home remedies for common ailments infographic. What are blackheads and why do they occur? Unfortunately, blackheads are incredibly common and also extremely annoying when they strike! Just like whiteheads, they are comedones, meaning that they are a caused by a build up of sebum and skin cells gathered in your pores and hair follicles. Each hair follicle contains a hair and a sebaceous glad, which produces an oil called sebum (which is really useful for keeping your skin nice and soft!). When dead skin cells and oils build up in the opening of the follicle, they produce a bump called a comedone. The difference between whiteheads and blackheads is that in blackheads, the pore or hair follicle is open, meaning that the oils are oxidized by the air and turn a dark brown. In a whitehead, the skin over the bump stays closed, meaning that oxidization can’t take place. Blackheads can occur anywhere there is a hair follicle. So, whilst they are most common on your face, nose, and forehead, they can also appear on the shoulders, back, neck, and chest. It’s a common misconception that blackheads are caused by dirt, but this simply isn’t the case. Pores naturally become clogged with dead skin and sebum, no matter how clean you are. And the larger your pores, the more of a problem this will be. The good news is that there are ways you can get rid of blackheads and prevent blackheads from occurring in the first place. However tempting it may seem, squeezing is not the best way to get rid of blackheads as it can lead to infection, inflammation, and scarring. Baking soda is a great way to get rid of blackheads and you’ll almost certainly have some tucked away in your store cupboard. The fine granules that make up the baking soda act as a natural exfoliant, clearing out anything that is clogging up your pores and causing blackheads. First, mix a tablespoon of baking soda with a few drops of water so that it forms a thick, spreadable paste. Then, apply to the problem areas, gently massaging it into your skin using a circular motion. Rinse with lukewarm water and pat your face dry with a towel. Moisturize to keep your skin nice and soft. Remember that baking soda can be quite drying on the skin due to its saltiness, so make sure you only use it one to two times per week. Thanks to their antiseptic properties, tomatoes can be really effective when it comes to natural blackhead removal. Take a medium to large sized tomato and mash it up using a fork or spoon. Next apply the juice and peel to your face, concentrating on the problem areas. If you’re wondering how to get rid of blackheads, cinnamon can be a good place to start. This anti-bacterial spice is widely available and also smells great! Mix together one part organic cinnamon with two parts organic honey until it forms a nice thick paste. Wash the paste away and finish with a nice dose of moisturizer. Whether you’re suffering from blackheads on your nose or forehead, or anywhere else on your body for that matter, a lemon and sugar scrub can help to unclog your pores. The two ingredients work really well together, with the sugar balancing out the acidic lemon and the lemon softening the rough sugar. Add a few squeezes of lemon juice to sugar. You can use brown or white sugar, which ever you’ve got in the house. Mix the lemon and sugar together until it forms a thick paste. Use the mixture to scrub your problem areas. Green Tea is not only good for your body, it is also a great home remedy for blackheads. The high levels of vitamins and anti-oxidants in the green tea help to break up any excess oil, which can lead to blackheads and other comedones, as well as helping to reduce any inflammation. Boil 8oz of water and remove from the heat. Place two bags of organic green tea in the boiled water and allow to soak for around an hour. Once an hour has passed, pour the liquid into a bowl and allow it to cool until lukewarm. Using cotton wool, dab the liquid onto the blackheads and other problem areas, and allow to dry (try and leave it on for at least 10 minutes). Rinse your face with cool water and pat dry before moisturizing. As this process is nice and gentle on the skin, you can repeat it daily to keep your skin clear and blackhead free. You might not have heard of it, but Fenugreek is one of the easiest and most effective home remedies for blackheads. Mix fresh fenugreek leaves with water until you have a thick paste. Apply the mixture to any areas affected by clogged pores. Sit back, relax, and allow the paste to dry. This usually takes around 10 – 15 minutes. Repeat daily to treat blackheads, other comedones, and blemishes. Apple cider is another natural home remedy that can be used to get rid of and prevent unsightly blackheads. The natural acids found in the apple cider make it a great accessible and affordable toner. Additionally, if you have skin tags, ACV is excellent at getting rid of them. Check out our infographic showing how to get rid of skin tags with apple cider vinegar. How to get rid of blackheads with apple cider vinegar. If your apple cider has a high concentration, mix it with a splash of water to reduce the acidity (you don’t want to cause irritation or damage your skin!). Apply the cider to cotton wool or a cleansing cloth and gentle wipe across the face, focussing on problem areas such as the nose and forehead. Most of us probably have a jar of honey lurking somewhere in the kitchen. But have you ever thought about using it to treat your skin? As both an anti-bacterial and an antiseptic, honey is really effective in the treatment of blackheads and other skin complaints. Of course, if you are allergic to honey, this is not an advisable treatment! Put a teaspoon of pure raw honey into a small jar and place it into a bowl of hot water. Leave the jar in the water until it is warm to the touch. Dab the warm honey onto the areas affected by blackheads and leave it to soak in for around 10 minutes. Using a warm, damp cloth, remove the honey and rinse your face. For best results, repeat this process daily. Turmeric has amazing anti-inflammatory and antioxidant properties, making it perfect for the treatment of blackheads. Remember though, that the spice that you use for cooking will stain your skin (and that’s not going to be a good look for anyone!). So make sure that you use Kasturi turmeric rather than the edible kind, you can usually find this in any Indian markets or stores. Here’s how to get rid of blackheads with turmeric. Mix a small amount of turmeric (remember to use the Kasturi kind!) with water or coconut oil. Mix the ingredients together until they form a thick paste. Dab the paste onto any blackheads, other comedones, or blemishes and allow it to soak for around 10 – 15 minutes. Repeat daily for optimum results. Epsom salts are not just great for muscles, they also offer an effective solution to the problem of how to get rid of blackheads, helping to unclog each pore and wash the contents away. Mix one teaspoon of Epsom Salts in hot water, stirring until the salts have dissolved completely, and add a couple of drops of iodine to the mixture. Allow it to cool until it reaches room temperature. Using cotton wool, apply the mixture to the forehead, nose, and any other problem areas, and leave to dry. Gently wash the face clean using a clean cloth, and pat dry. With its high alpha-hydroxy acid (AHA) citric acid content, lemon juice naturally removes dead skin and is perfect for blackhead removal. The vitamin C found in lemon juice is also an anti-oxidant and stimulates collagen production, helping to improve the overall health of the skin and reducing scarring. Firstly, wash your face with a gentle, natural cleanser. Squeeze a teaspoon of juice from an organic lemon into a bowl. Using a small cotton ball, dab the lemon juice onto your blackheads and clogged pores. Allow the juice to dry, this usually takes around 10 – 15 minutes, and then rinse with clean, cold water. You can use this gentle treatment once every day to keep your skin clear and free from blackheads and blemishes. Mixing natural honey with raw egg whites will create an effective paste that will not only remove your blackheads, it will also leave your skin with a beautiful, natural glow. Crack a raw, free-range egg and extract the yolk. Dispose of the yolk and place the egg white in a bowl. Add natural honey and mix well until a paste forms. Apply the paste all over your face, concentrating on problem areas such as the nose and forehead. Leave the paste to dry for around thirty minutes, before rinsing with warm water and patting the face dry with a clean cloth or towel. When you’re considering how to get rid of blackheads, oatmeal might not be the first thing that springs to mind! But with its ability to soothe irritation, remove dead skin cells, and soak up excess oil, it should definitely be on your list. Cook enough oatmeal to cover your blackheads. Allow the oats to cool to room temperature and apply to the problem areas. Leave the mask to dry for 10 to 20 minutes and rinse with warm water. Mix together three teaspoons of yogurt with two teaspoons of oatmeal and a few drops of olive oil and lemon juice. Apply the paste to your face, as you would a facemask. Allow to soak in for around 10 minutes before rinsing with warm water. In addition to all of these treatments and remedies, washing your face with water once or twice each and everyday is vital. This helps to prevent blackheads by washing away excess sebum and dead skin, keeping the pores clear and smaller in appearance. Twice each day, splash your face with fresh, clean water. The optimum times to do this are morning and evening, or afternoon and evening. Gently pat your face dry with a soft towel. Apply your moisturizer to prevent your skin from drying out, if this happens, it will produce excess sebum to accommodate for the dryness and you’ll be back to square one! If you can’t get your hands on any of the other home remedies listed above, you can always try a toothbrush and toothpaste – although we’d recommend investing in a new toothbrush, rather than the one you use to brush your teeth! Personally I would try all the other home remedies on this how to get rid of blackheads post first, but lots of people do swear by using toothpaste to get rid of blackheads, so we’ve included it on the list. Put a small amount of toothpaste on the toothbrush and wet both the toothbrush and the problem area on your face or body. Very gently, scrub the affected area with the toothbrush, taking care not to brush too hard and damage the skin. Make sure you avoid the eye area as the toothpaste can cause stinging and irritation. Repeat this process each day until your blackheads clear up, but make sure that you soak the toothbrush after each scrub with boiling hot water. There you go – 15 home remedies that solve the problem of how to get rid of blackheads fast, without expensive blackhead creams and strips.